Kirk and I just traveled again to Iraq, but this time with the largest For Hearts and Souls’ team we’ve ever taken there, staying the longest we’ve ever stayed. 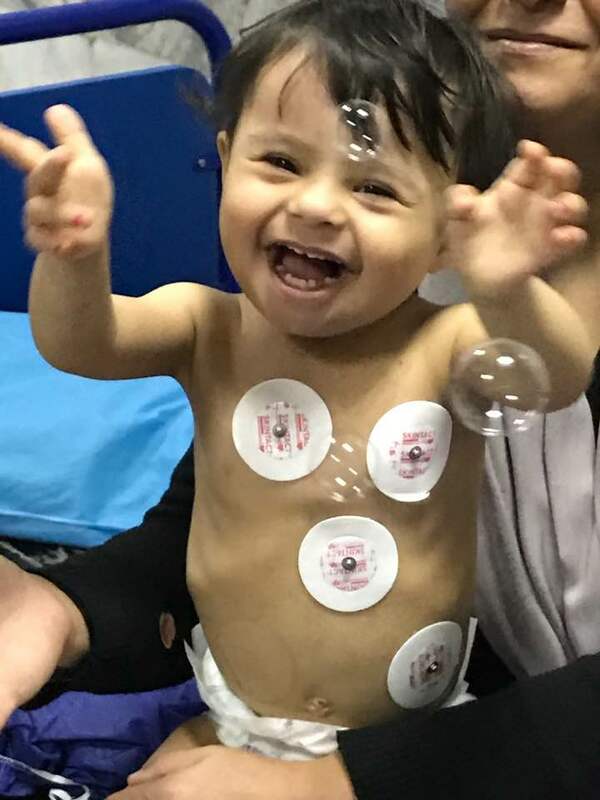 Over the course of two weeks, 29 people undertook our usual pediatric heart work, as well attempted to serve the thousands of refugees found in camps there. In total, we had three pediatric cardiologists (Kirk, Allison Cabalka, and Mary Porisch), one pediatric heart surgeon (John Kupferschmid), two anesthesiologists (me and Mauri Garcia), one perfusionist (Bart Hensler), five nurses (Nelia Soares, Molly King, Amy Howson, Vanessa Dennis, Nancy Lopez), one child life specialist (Caley Johns), one EMT (Lori Hintz), one medical assistant (Bethany Hutsell), one premed student (Kyle Johnson), one balloonologist (Tim Sanken), and many other willing servants (Jeff Cabalka, Holly Folsom, Alline Goeke, Lisa Goeke, Kathy Hintz, Drew Milhoan, Trevor Owen, Dave Rich, Coleen Rishovd, Rachel Rishovd, Jacque Simon, and Ann Sugrue). Some came for part of the time, while some came for all of the time. Some only served on the medical team; some only served on the refugee team; and some were able to serve both. My bosom friend (please note the “Anne of Green Gables” reference, in honor of the two nurses on our team from Prince Edward Island) Holly joined us from Maui. We met in 1999 when she was serving as a long-term missionary in Mexico. She’s also served long-term in Honduras and short-term in India and Nepal. She has known me well for the entire span of For Hearts and Souls’ existence and loves to pepper me with questions about everything I do. She kept exclaiming, “Now I understand why you have such a hard time explaining these trips. How do you even begin to put it into words?” Good question. Though I’ll start with the potentially long and dry narrative of what we actually did, I’ll finish with the more important spiritual lessons of the trip. We, and most of the team, arrived in Erbil, the capital of autonomous Iraqi Kurdistan, at one in the morning on Saturday, January 21. We arrived at our hotel in Duhok at six in the morning, took a nap and a shower, ate breakfast, and arrived at the hospital by 10 a.m. Over the course of ten hours, we screened over 70 pediatric patients who have congenital heart disease and came up with a tentative schedule for a week of procedures at the Azadi Heart Center in Duhok. Screening means we verify the child’s diagnosis, usually by echocardiogram (ultrasound of the heart), and decide on a treatment plan. That plan can include continuing to follow, placing on medicines, recommending surgery either in or out of the country, or recommending diagnostic or interventional cardiac catheterization procedures. From Sunday through Thursday, we performed seven open-heart surgeries requiring cardiac bypass (closing holes or relieving obstructions to flow in the heart) and 22 heart catheterizations (done via the femoral vein and/or artery in the groin; either diagnostic or interventional, which means saving children from surgery by closing holes or vessels or opening obstructed valves). Almost every evening after our procedures were done, we screened more patients…and then were hosted at various dinners by the Heart Center, by the Minister of Health for Duhok, and in the homes of Dr. Kamal, one of the pediatric cardiologists we work closely with, and a patient’s family who had her heart surgery at Mayo Clinic in Minnesota. Team members stayed in the hospital to care for recovering patients on two overnights. And every day team members served in the refugee camps as well, distributing food, playing with children, hearing stories, being present, counseling, and praying. Estimates are hard to come by, but there are easily hundreds of thousands of refugees (Syrian, Arab, Kurdish, Yazidi, Christian, Muslim) in and around multiple camps of varying conditions. Many of our patients and their families are refugees as well. On Friday, the only official workday off in Iraq, we stopped by the hospital to quickly round on our recovering patients before leaving Duhok. Kirk had been requested to screen a child whose family had been recently liberated from ISIS in Mosul. We met a team from Samaritan’s Purse (SP) and they took our doctors and nurses to their recently established surgical field hospital outside Mosul, so Kirk could ultimately give relatively good news to this family (he has a heart condition that is easily treated within the country and has a prognosis for a normal life span if he is treated by age 20). We were so grateful for the opportunity to witness the amazing work that SP is doing at this hospital. It is truly a top-notch, professional, highly secure set-up and we would encourage anyone with appropriate skills to volunteer. We then drove to Shoresh, to the Fountain of Love, a community center built by SP in a community established by widows and orphans from Saddam Hussein’s anfal (genocide) of the Kurds. We screened at this center when it first opened and we make every effort to return when we can. We screened nearly 30 patients in the afternoon and evening on Friday and then 60 more into the afternoon on Saturday. Allison had left Thursday night, so Mary arrived Saturday. She and Dr. Aso, the pediatric cardiologist we work with in Slemani, screened patients for us in Slemani simultaneously on Saturday and came up with the procedure schedule for our week there. Our remaining team drove from Shoresh to Slemani on Saturday evening. From Sunday through Wednesday of our second week, we performed 19 catheterizations in Slemani. We screened more patients. Our refugee team served at more refugee camps and other ministries. We were generously hosted by Kurdistan Save the Children (KSC) during our time there and had dinners each night with Dr. Aso and representatives from KSC, the Heart Center, and the Slemani Minister of Health. We chose to do our cases in Slemani in four days so we could use the fifth to go screen patients in Halabja, a town on the border with Iran on which Saddam Hussein used chemical weapons in 1988. We were there to screen children at the request of Sarko with SP in November 2013 and he has been requesting us to return ever since. It turned snowy and icy on Wednesday night and our in-country hosts begged us not to go, so we made the late night decision to cancel. The roads did not look so bad on Thursday morning and Sarko made a strong emotional appeal, so KSC arranged for a driver with snow tires and Kirk, Mary, Tim, and I made the trip to Halabja to screen probably around 65 patients. We returned in time to meet the team for dinner at Dr. Aso’s house and then we left for the airport at one in the morning. We are en route home as I write this. Those are the facts. More important to me are the spiritual lessons, which I am largely directing to American Christians, including myself. First lesson: go. Go because Jesus said so (Mark 16:15). Go because there are people suffering and hurting, who have been through things that you cannot imagine and living in conditions that you cannot imagine that need to know that God loves them and His people have not forgotten them. Go because you are a temple of the Holy Spirit (1 Corinthians 6:19) and your presence brings Him near. Go because you need to be reminded of how blessed you are living in (I say this unapologetically after lots of international service and travel), though not perfect, the greatest nation on God’s green earth. Go because politics and wars and presidential elections become real and not just something you debate on social media (I’ll write about this separately). Go because you get to witness the tears in your Kurdish colleague’s eyes when he hears from a friend that he had not heard from in two years who called to tell him he was safe in Mosul from ISIS. Go because you see miracles. At one of the camps, Ann was able to counsel and pray with a man who had literally not left his tent for two years. The next day he was found wandering around the camp, clear headed, and telling everyone he was healed because someone came to pray for him. Second lesson: by the grace of God, you are capable of more than you think. These trips are grueling. Our in-country time started and ended at 1 a.m. and it seemed fairly non-stop in between. There is nothing in my nature that wants to endure this. I want rest, ease, and lots of sleep. Self-protection has infiltrated the U.S. church. We serve a loving, relational God who sent His Son to serve and suffer and die…and then conquer death by resurrecting and proving Himself as a person of the triune God…who sends His Holy Spirit, the third person of the Trinity, to enable us to follow our Master in love and service of His children, even if it means suffering and dying. We have no fear of death, so we are free to serve. And we are empowered by the Holy Spirit to do so. You cannot know what you are capable of through the power of the Holy Spirit unless you step out of your comfort zone and allow Him to enable you. Third lesson: God answers prayer. For the past couple years, our church has organized NEST (Necessarily Encouraging, Spiritually Transforming) teams that agree to pray for us while we’re gone. Each team member submits a daily e-mail prayer that we got to read, and I know they spend time additional time praying (and even fasting) for us as well. We had two teams praying for us this time, so two prayers to read each day. I cannot tell you how these simply emotionally and spiritually encourage. They also amaze because you see the Holy Spirit directing people to pray for things we did not tell them we needed. It is a mystery that God is in control and His will is sovereign, but yet our prayers have power. We attribute our safety, our health, our logistics, our patient outcomes, everything we do on these trips to the power of people upholding us in prayer. That’s another lesson: if you cannot go, you can always pray…and you should never discount the magnitude of that contribution. Fourth lesson: oh, the beauty of the Body of Christ. I’m slightly stealing his thunder because Jeff Cabalka wrote a beautiful devotional that he is going to deliver to his Community Bible Study in Minnesota about his first trip to Iraq. Like me, he is married to an energetic, somewhat fearless pediatric cardiologist who doesn’t mind going to serve in scary places. Like me, when his spouse asked him to join him on one of these trips, he had to face his fears, his true belief in his eternal security, and his misgivings about what he had to offer. He learned that God had designed him with unique gifts and personality that allowed him to serve in ways others couldn’t. These trips teach me this lesson so profoundly. We are each uniquely gifted and have unique personalities. We on the medical team believe our medical gifts open doors and give us access to people we would not otherwise have access to, but we are often so busy doing the medicine, we need others to do the more important relational, emotional, spiritual work that we cannot do. This trip also very much demonstrated how we come together as the larger body of Christ. There were so many people and ministries cooperating that were necessary and to whom we are grateful: Millennium Reach, Samaritan’s Purse, Joint Help for Kurdistan, Fountain of Love, Shevet Achim, and Kurdistan Save the Children. Fifth lesson: never doubt the goodness of God. This was the subject of one of Kirk’s daily team devotionals. We who are stuck in time often question the goodness of God and fail to see how He is working His plans out over time and eternity. We got a glimpse in the story of Achmed. We met him years ago in Fallujah while serving there in conjunction with Preemptive Love Coalition (PLC) and Living Light International. He had a unique defect in his heart that needed a unique device to fix it. We had planned to return with that device and take care of him before ISIS intervened, prevented our return, and destroyed the cath lab we worked in there. Achmed’s family fled and currently lives in Kurdistan. His father has kept up with us and advocated for us to return and take care of his son. We were finally able to do just that on this trip. This enabled the father to see how God orchestrated events in answer to his prayers in order for his son to receive care. God’s ultimate desire is that we come to know Him and spend eternity with Him. Disruptive events on this earth may not make sense to us unless we see in them the hand of God bringing people to Himself. Last lesson: overwhelming gratitude. I’m thankful for the loving God who sent His Son to save me and sends His Spirit to teach, comfort, and empower me. I’m thankful for His countless, overwhelming blessings that I do not deserve. I’m thankful He lets us see His power and His work. I’m thankful for everyone who gave, prayed, and served on this trip. And I’m thankful for the many who support us, encourage us, pray for us, and bother to read these updates. May God be glorified. Great things He has done.